This November there are 2 major events taking place near you! World Luxury Expo Doha 2014: 13-15 November 2014, at the St.Regis Hotel in Doha, Qatar. World Luxury Expo Doha 2014 is an annual event that will showcase leading international luxury brands to the most discerning network of private clients. The focus of World Luxury Expo Doha in 2014 is to explore the ultra-affluent and prestigious world of international luxury goods. ARABEX 2014: 26 November – 1 December 2014, at Al Ain Convention Center, Al Ain, UAE. The 2nd Arabia Style Exhibition 2014, ARABEX, will be held in Al Ain City, United Arab Emirates. ARABEX brings together a diverse customs and cultures of Arabs covering a broad spectrum of different products including arts and handicrafts, fashions, costumes and cuisine of different Arabian countries. This exhibition will be the meeting point for importers, manufactures and leading trade figures to get all in face to face experience with the latest global Arabian style. The show helps to exchange market information, learn the latest innovations, gain views of experts and make direct business contacts. For a full list of all wedding and fashion events and exhibitions, click here! 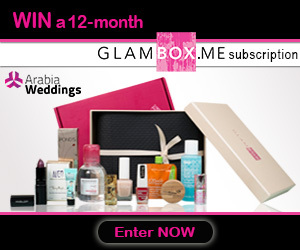 WIN a free 12-month subscription from GlamBox to receive a beauty box to your doorstep every month. Each month’s box features deluxe sample-sized products by various international brands, so you can discover and try the greatest and the latest in beauty products. Win a 12 Month Subscription! GlamBox Celebrity Look Contest! All you need to do is upload an image of your favorite celebrity look and share it with your friends to collect as many Facebook ‘Likes’ as you can. Send an e-mail to: glambox.competition@gmail.com with the phrase ‘Hello Beauty’. Click here to Like Arabia Weddings’ Facebook page and fill in the form. Ask your Facebook friends to Like your celebrity image as soon as you receive an e-mail from us approving your application. A12-month subscription from GlamBox Middle East where you will receive a monthly beauty box to your doorstep worth AED 849. The contest will start on Monday, 25 August 2014 and ends on Sunday, 14 September 2014 at 12:00 a.m. The winner will be announced on Monday, 15 September. Participants living in Saudi Arabia and the United Arab Emirates are only able to take part in this contest. Participants should Like the Facebook page of Arabia Weddings and send an e-mail toglambox.competition@gmail.com with the phrase ‘Hello Beauty’ to be illegible to win. See requirements above. Contestants can participate only once. The winner is the one who gets the biggest number of Facebook ‘Likes’ on their celebrity image. Minimum number of Likes is 200. Each contestant can collect the ‘Likes’ in any way she wants; Arabia Weddings is not responsible for how the Likes are being collected. Your free annual GlamBox subscription cannot be redeemed in cash. All terms and conditions above must apply in order to enter and win the contest. To find out more about GlamBox Middle East, visit their website www.glambox.me. Here is your Ramadan 2014 page! We’ve compiled great content to help you look and feel your best in Ramadan, while you’re planning your wedding and getting ready for married life. Arabia Weddings’ team wishes you all a happy and blessed new year. We would also like to thank all our readers and fans, whether they just like to browse our website our actually contribute to it. Make this year a special one! Make sure you start 2014 with the best mascaras you can find around!